I know it's a bit silly to look for low-fat "butter cream" as the whole point of using butter is the "full-fat", isn't it? There were some recipes that use baking margarine or low-fat spread to make a butter cream substitute. However, I heard that the "margarine cream icing" has never tasted good. Well, in that case, I thought to myself, why not use a small amount of butter to keep some flavour of butter and add something to reduce the total amount of fat. So, I made butter and crème fraiche icing. This was my first attempt and I loved it. My cream keeps the lovely butter flavour and yet is very fluffy and light. It has a slightly cream cheese flavour which is a great. I made this cream with 50g butter and 100g crème fraiche. 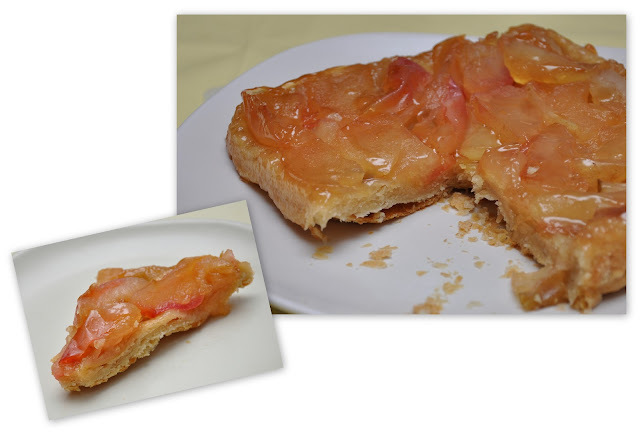 I like the soft and light texture, but it is a bit messy to eat. So, for good solid piping, I would recommend 50g butter and 50g crème fraiche. Then you can add crème fraiche little by little until the texture becomes how you like it. Fold in the flour using a large metal spoon, adding a little milk to make a dropping consistency if needed. Spoon the mixture into the paper cases until they are half full. Bake in the oven for 15-20 minutes, or until golden-brown on top and a skewer inserted into one of the cakes comes out clean. Set aside to cool for 10 minutes, then remove from the tin and cool on a wire rack. For the butter cream icing, beat the butter in a large bowl until soft. Add half the icing sugar and beat until smooth. Then add the remaining icing sugar with crème fraiche, adding more crème fraiche if necessary, until the mixture is smooth and creamy. Add the food colouring and vanilla extract and mix until well combined. Little Choux buns filled with custard cream bring back memories of my childhood. 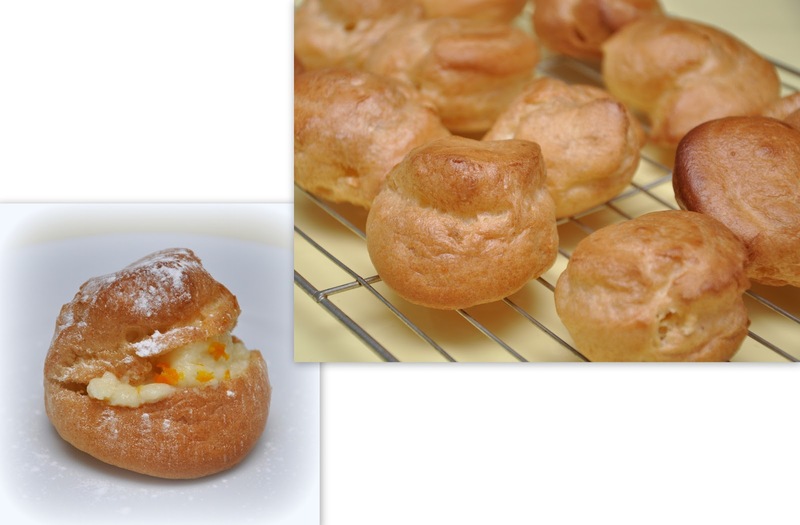 We Japanese people call them シュークリーム, "Choux a la Creme Anglaise." They were very popular pastries in those days and I believe they still are. My mum never made them but bought them quite often from the bakery. As a little girl at that time, I adored the little crusty buns filled with thick creamy eggy custard. I never knew that British people eat "hot" custard until I came to England and it was a bit of a culture shock. Custard had been always thick and cold and never ever hot and runny in my mind. So, I asked my English friend what on earth was that yellow liquid. Anyway, here are my simple Choux a la Creme. I enjoy making choux pastry. It's fun to see the constancy of the dough dramatically change in the saucepan. I made low-fat custard cream this time. Making home-made custard is also a joy. Stirring the custard continuously until gradually the liquid turns to "proper" custard is a kind of therapy I think. I added a bit of orange zest at the end to make citrus infused custard. As you are going to need to 'shoot' it quickly into the water and melted butter, sift the flour into a bowl and add a teaspoon of caster sugar and pinch of salt and set aside. Put 150ml of cold water in a medium-sized saucepan together with 50g of butter, cut into small pieces, then place the saucepan over a moderate heat and stir with a wooden spoon. As soon as the butter has melted and the mixture comes to the boil, turn off the heat immediately, as too much boiling will evaporate some of the water. Then tip the flour in – all in one go – with one hand, while you beat the mixture vigorously with the other. You can do this with a wooden spoon. Beat 2 large eggs well, then beat them into the mixture – a little at a time, mixing each addition in thoroughly before adding the next. 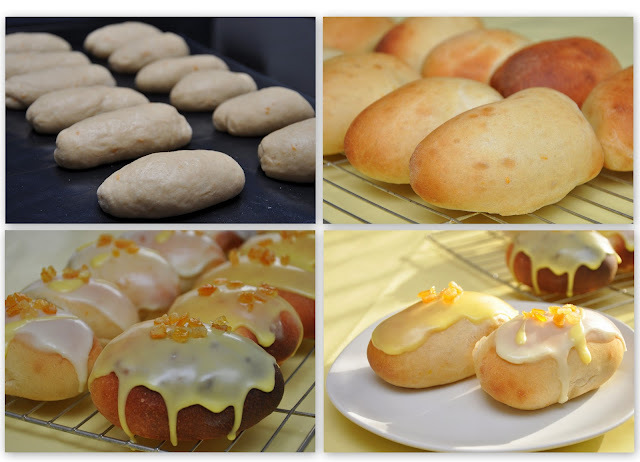 Fill a plain-nozzle piping bag with the choux dough and pipe the dough into small buns about 5cm/2in in diameter onto the baking tray, leaving at least an inch between each buns. bake on a high shelf in a pre-heated oven – gas mark 6, 400°F (200°C) – for 10 minutes. After that, increase the heat to gas mark 7, 425°F (220°C), and bake for a further 15-20 minutes until the buns are crisp, light and a rich golden colour. Pierce the side of each one to let out the steam. Put the pastries back in the oven for a few minutes to completely dry out. Then cool them on a wire rack. Whisk flour and half of milk in a medium sauce pan until smooth. Whisk in the remaining half of the milk and add vanilla extract. .Bring the mixture to boil over medium heat, stirring constantly, then reduce heat to low, cook for 1 minute or until sauce thickens. In a small bowl, whisk together eggs and sugar. While beating constantly, add a little bit of milk mixture to the bowl to temper the eggs. Then add the egg into the milk mixture. Cook over low heat, stirring constantly for 5 minutes or until sauce thickens. Strain through a sieve into a clean bowl. I have been searching for a low-fat lemon tart recipe for quite sometime. Then, I found a "relatively" low-fat recipe for my favourite lemon tart from the BBC GoodFood website. Rub the butter into the flour until the mix looks like fine breadcrumbs. Stir in the icing sugar, then make a well and use a round-bladed knife to stir in the oil, egg yolk and 1½-2 tbsp cold water until the dough comes together. Without overhandling, gather into a ball. On a lightly floured surface, roll out so it fits a 23 x 2cm loose-bottom flan tin. Ease the pastry into the tin, then trim the edges by rolling the rolling pin over the top. Press the pastry into the flutes so it sits very slightly proud of the edge (this extra height helps in case of any shrinkage). Lightly prick the pastry base with a fork, then chill for about 10 mins. Heat the oven to 190C / 170C fan / gas 5. Meanwhile, make the filling. Beat the eggs and egg whites together with a wooden spoon until well mixed. Sift the icing sugar into a bowl, then gradually beat in the eggs. If the mix is at all lumpy, simply beat with a wire whisk. Stir in the lemon zest and the juice. Leave to stand so the lemon flavour can develop. Sit the chilled pastry case on a baking sheet. Line with baking parchment and baking beans and bake blind for 15 mins until well set. Carefully lift out the beans and paper, then bake the pastry case for another 3-5 mins until the base is cooked and pale golden. (I pre-baked the pastry without using baking parchment and baking beans for 15 minutes). Strain the lemon mixture through a sieve. Beat the crème fraîche in a medium bowl until smooth, then slowly stir in the lemon mix until well blended. Transfer to a jug, then carefully pour two thirds into the warm pastry case. Place in the oven with the oven shelf half out, pour in the rest of the filling, then carefully slide the shelf back in. Reduce the heat to 150C/130C fan/gas 2. Bake for 25-30 mins until barely set with a slight wobble in the middle. 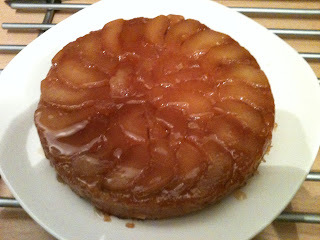 Cool for about 1 hr, then serve with a light dusting of icing sugar. Best eaten the same day. ... and it was quite difficult to shape the dough into "fingers." So, it's all good, isn't it? 1. Place the flour, water, milk, yeast, salt, sugar and lemon (or orange) zest into a large bowl and mix. Add the beaten egg and butter and continue to mix until the mixture comes together as a sticky dough. 2. Tip the dough onto a lightly floured work surface and knead for ten minutes, or until the dough is smooth and elastic. 3. Lightly oil a bowl with a little of the vegetable oil. 4. Place the dough into the bowl and turn it until it is covered in the oil. Cover the bowl with cling film and set aside in a warm place for one hour, or until the dough has doubled in size. 5. Lightly grease two baking trays. 6. Knock the dough back to its original size and turn it out onto a lightly floured work surface. Divide the dough into twelve portions, shape them into long oval and place onto the baking trays. Ensure the buns are well spaced. Cover with a tea towel and set aside to prove for 30 minutes. 7. Preheat the oven to 220C/425F/Gas 7. 8. Bake the buns in the oven for 10-15 minutes or until well risen and golden-brown. Remove the buns from the oven and set aside to cool on a wire rack. 9. Meanwhile for the icing, mix the icing sugar and lemon juice (and food colouring if you like) together in a bowl until smooth. 10. 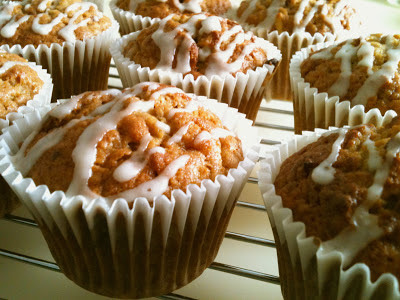 Once the buns have completely cooled, spread the icing on top of them and set aside until the icing has hardened. Decorate with orange/lemon peal. I found Mary Berry's technique, which grates butter and lard with a cheese grater very useful. Both butter and lard should be ice cold to do a good grating job in order not to melt the fat. I put the butter and lard in the freezer for a while before using it. 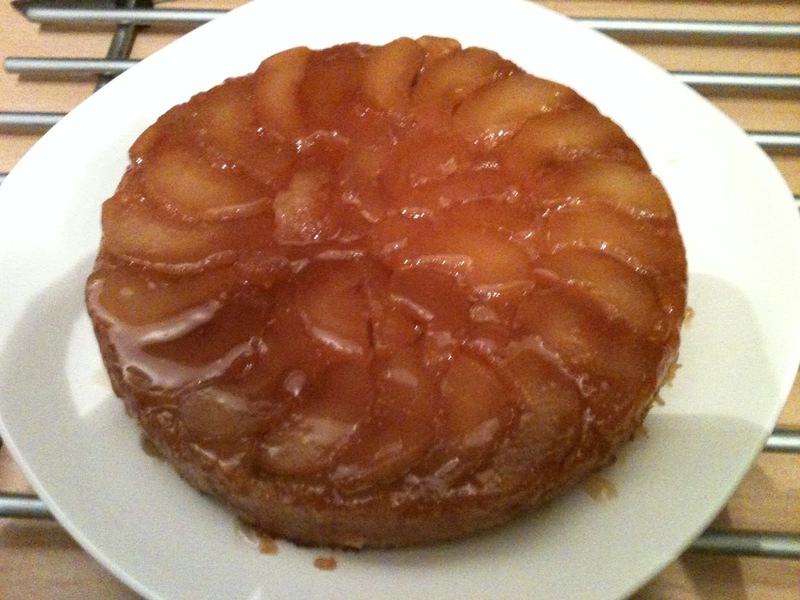 I followed Mary's apple tart tatin recipe for this.